Liz Holland, standing at left, leads a "mature workers" seminar for people like Deborah Luger, 56, seated at left, who wants to be more attractive to employers. VASHON ISLAND, Wash. - Patricia Reid is not in her 70s, an age when many Americans continue to work. She is not even in her 60s. She is just 57. But four years after losing her job she cannot, in her darkest moments, escape a nagging thought: she may never work again. College educated, with a degree in business administration, she is experienced, having worked for two decades as an internal auditor and analyst at Boeing before losing that job. But that does not seem to matter, not for her and not for a growing number of people in their 50s and 60s who desperately want or need to work to pay for retirement and who are starting to worry that they may be discarded from the work force â€” forever. Since the economic collapse, there are not enough jobs being created for the population as a whole, much less for those in the twilight of their careers. Of the 14.9 million unemployed, more than 2.2 million are 55 or older. Nearly half of them have been unemployed six months or longer, according to the Labor Department. The unemployment rate in the group â€” 7.3 percent â€” is at a record, more than double what it was at the beginning of the latest recession. After other recent downturns, older people who lost jobs fretted about how long it would take to return to the work force and worried that they might never recover their former incomes. But today, because it will take years to absorb the giant pool of unemployed at the economy's recent pace, many of these older people may simply age out of the labor force before their luck changes. For Ms. Reid, it has been four years of hunting - without a single job offer. She buzzes energetically as she describes the countless applications she has lobbed through the Internet, as well as the online courses she is taking to burnish her software skills. Still, when she is pressed, her can-do spirit falters. Being unemployed at any age can be crushing. But older workers suspect their résumés often get shoved aside in favor of those from younger workers. Others discover that their job-seeking skills - as well as some technical skills sought by employers â€” are rusty after years of working for the same company. Many had in fact anticipated working past conventional retirement ages to gird themselves financially for longer life spans, expensive health care and reduced pension guarantees. The most recent recession has increased the need to extend working life. Home values, often a family's most important asset, have been battered. Stock portfolios are only now starting to recover. According to a Gallup poll in April, more than a third of people not yet retired plan to work beyond age 65, compared with just 12 percent in 1995. Forced early retirement imposes an intense financial strain, particularly for those at lower incomes. The recession and its aftermath have already pushed down some older workers. In figures released last week by the Census Bureau, the poverty rate among those 55 to 64 increased to 9.4 percent in 2009, from 8.6 percent in 2007. But even middle-class people who might skate by on savings or a spouse's income are jarred by an abrupt end to working life and to a secure retirement. As an auditor, Ms. Reid loved figuring out the kinks in a manufacturing or parts delivery process. But after more than 20 years of commuting across Puget Sound to Boeing, Ms. Reid was exhausted when she was let go from her $80,000-a-year job. Stunned and depressed, she sent out résumés, but figured she had a little time to recover. So she took vacations to Turkey and Thailand with her husband, who is a home repairman. She sought chiropractic treatments for a neck injury and helped nurse a priest dying of cancer. Most of her days now are spent in front of a laptop, holed up in a lighthouse garret atop the house that her husband, Denny Mielock, built in the 1990s on a breathtaking piece of property overlooking the sound. As she browses the job listings that clog her e-mail in-box, she refuses to give in to her fears. "If I let myself think like that all the time,"� she said, "I could not even bear getting out of bed in the morning." With her husband's home repair business pummeled by the housing downturn, the bills are mounting. Although the couple do not have a mortgage on their 3,000-square-foot house, they pay close to $7,000 a year in property taxes. The roof is leaking. Their utility bills can be $300 a month in the winter, even though they often keep the thermostat turned down to 50 degrees. They could try to sell their home, but given the depressed housing market, they are reluctant. It is not just the finances that have destabilized her life. Her husband worries that she isolates herself and that she does not socialize enough. "We've both been hard workers our whole lives,"� said Mr. Mielock, 59. Ms. Reid sometimes rose just after 3 a.m. to make the hourlong commute to Boeing's data center in Bellevue and attended night school to earn a master's in management information systems. Here in the greater Seattle area, a fifth of those claiming extended unemployment benefits are 55 and older. 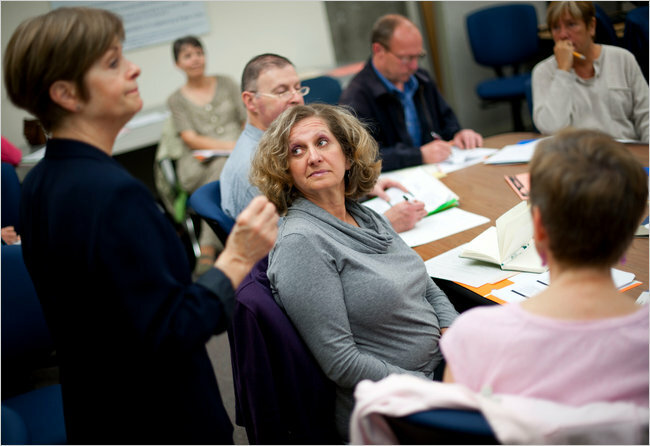 To help seniors polish their job-seeking skills, WorkSource, a local consortium of government and nonprofit groups, recently began offering seminars. On a recent morning, 14 people gathered in a windowless conference room at a local community college to get tips on how to age-proof their réumés and deflect questions about being overqualified. Ms. Howland, 61, ticked off the reasons those statements were inaccurate. But a clear undercurrent of anxiety ran through the room. "Is it really true that if you have the energy and the passion that they will overlook the age factor? "� asked a 61-year-old man who had been laid off from a furniture maker last October. During a break, Anne Richard, who declined to give her age, confessed she was afraid she would not be able to work again after losing her contract as a house director at a University of Washington sorority in June. Although she had 20 years of experience as an office clerk in Chattanooga, Tenn., she feared her technology skills had fallen behind. "I don't feel like I can compete with kids who have been on computers all their lives,"� said Ms. Richard, who was sleeping on the couch of a couple she had met at church and contemplating imminent homelessness. Older people who lose their jobs take longer to find work. In August, the average time unemployed for those 55 and older was slightly more than 39 weeks, according to the Labor Department, the longest of any age group. That is much worse than in August 1983, also after a deep recession, when someone unemployed in that age group spent an average of 27.5 weeks finding work. At this year's pace of an average of 82,000 new jobs a month, it will take at least eight more years to create the 8 million positions lost during the recession. And that does not even allow for population growth. Advocates for the elderly worry that younger people are more likely to fill the new jobs as well. "I do think the longer someone is out of work, the more employers are going to question why it is that someone hasn't been able to find work,"� said Sara Rix, senior strategic policy adviser at AARP, the lobbying group for seniors. "Their skills have atrophied for one thing, and technology changes so rapidly that even if nothing happened to the skills that you have, they may become increasingly less relevant to the jobs that are becoming available." In four years of job hunting, Ms. Reid has discovered that she is no longer technologically proficient. In one of a handful of interviews she has secured, for an auditing position at the Port of Seattle, she learned that the job required skills in PeopleSoft, financial software she had never used. She assumes that deficiency cost her the job. Ms. Reid is still five years away from being eligible for Social Security. But even then, she would be drawing early, which reduces monthly payments. Taking Social Security at 62 means a retiree would receive a 25 percent lower monthly payout than if she worked until 66. Ms. Reid is in some ways luckier than others. Boeing paid her a six-month severance, and she has health care benefits that cover her and her husband for $40 a month. And she admits some regrets: she had a $180,000 balance in her 401(k) account, and paid $80,000 in penalties and taxes when she cashed it out early. She did not rein in her expenses right away. And now, her $500-a-week unemployment benefits have been exhausted. She has since cut back, forgoing Nordstrom shopping sprees and theater subscriptions, but also cutting out red meat at home and putting off home repairs. In order to qualify for accounting posts, she is taking an online training course in QuickBooks, a popular accounting software used by small businesses. She recently signed up for a tax course at an H&R Block tax preparation office in Seattle. And she is plugging ahead with her current plan: to send out 600 applications to accounting firms in the area, offering her services for the next tax season. Eventually, she wants to open her own business. With odd jobs and her husband's - albeit shriveled - earnings, she could stagger along. For now, she stitches together an income by gardening for neighbors, helping fellow church members with their computers, and participating in Internet surveys for as little as $5 apiece. Copyright 2010 The New York Times Company. Reprinted from The New York Times, National, of Saturday, September 19, 2010.